Do you know how the word “deadline” came to be? Etymologists trace its origins back to Civil War times when it was used to describe the boundary line of a prison camp that inmates could not pass, under penalty of being shot. One study found that meeting task deadlines is the greatest cause of marketing inefficiency for content producers, with 92% of respondents calling it out as a culprit. Irina Tsumarava, cofounder of the marketing agency Kraftblick, candidly shared a story from her own team’s experience to exemplify why deadlines get missed. In this case, there were a multitude of different reasons, but they all tied back to one thing: everyone was really busy. Contributors became focused on their own urgent tasks that pulled them in different directions, losing sight of team-based initiatives. “We needed to stick to our weekly plans while maintaining necessary flexibility,” she concluded. The solution in their case was to implement careful weekly planning sessions, along with daily revisions and updates. They also started weighing the consequences of missing various deadlines, to help with prioritizing. DivvyHQ founders, Brock and Brody, battled with this as well in their former agency days, which is why they designed our content calendar software to address it directly. I can’t guarantee that you’ll never miss a deadline while using DivvyHQ, but I can guarantee that a deadline will never sneak up on you or slip by unnoticed. Our platform includes four key functions to ensure this. The first part is simple. When people can see a due date on a calendar attached to a content item, there’s no ambiguity about when it should be completed. 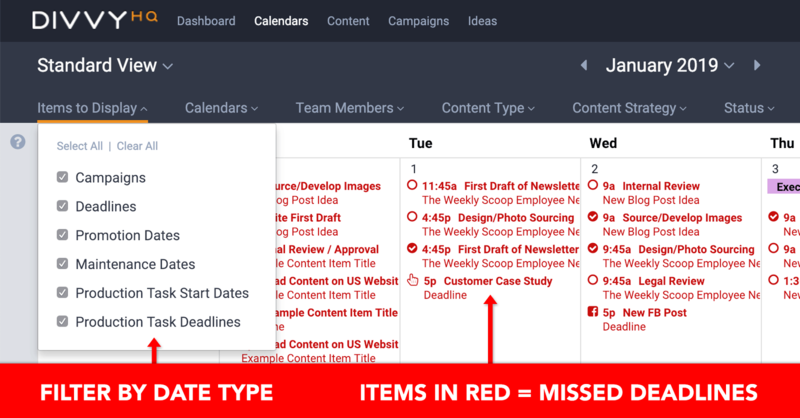 Upon signing into DivvyHQ, you’ll find a “Content Items Due” tab front-and-center on your personal dashboard, with any tasks that are past due highlighted in red to quickly grab your attention. You can also pull up your full calendar for a simple view of the weeks ahead, getting a full picture of what’s coming down the pipeline. Because content items in DivvyHQ are broken down into customizable workflows (i.e., First draft, Revisions, Second draft, Final QA, Upload into CMS, Schedule/Publish), it’s much easier to catch an item that’s drifting off course before the actual deliverable lapses its deadline. For instance, if you see that the second draft of a post is due today, but you haven’t completed the first yet, your team can rally and shift resources to get caught up and back on track. Through in-app and email notifications, as well as the ability to comment on items in DivvyHQ, communication is instant. When a writer submits the first draft of a content piece, the editor is automatically notified immediately and can jump in right away. When a designer uploads the two custom images needed for a blog post, they don’t need to write a separate email to inform the project owner, because that person has already been alerted by the app. There’s no communication gap, and in the vast majority of cases, we find those are at the root of deadline issues. Content calendar software like DivvyHQ is built to eliminate these gaps and tighten up collaboration. Deadlines can be stressful for content teams. Granted, not as stressful as stepping past one of those original deadlines in Civil War days (duck! ), but still pretty agitating. When you organize your projects and tasks in a content calendar software tool like DivvyHQ, it takes several things off a content manager’s plate. You don’t need to constantly be thinking about when things are due, guessing at the status of each project, or manually pinging people to get updates, because that’s all taken care of for you. This is just one of our many simple efficiencies designed to make life smoother for you and your team. Give DivvyHQ a try for two weeks and find out for yourself how much easier it is to hit deadlines and keep collaborative content initiatives moving forward.